Most of us these days have microphones (mike) available for our desktop computers and it is usually integrated by default for most laptops. But what if we do not have a mike readily available when it is needed badly? It is true that all of us are hackers intuitively. Whenever we do not have something that we need, we try to make use of other available things to get our work done. We shall do the same here. Whenever you do not have a microphone available, you can use your earphones (speakers or headset) as a microphone. Yes, this really works. Just plug-in your earphones into the microphone port (RCA female adapter) and you are done. Keep the earphones in front of your mouth and start speaking. It works quite well. But in most cases only one earphone works out of the pair of two. Check out for yourself which one is working. This is a cool trick when it is urgent to use microphone where it is not available. Then why buy a Microphone? Although earphones can work as microphones to some extent, they cannot completely replace it as they cannot provide you the voice quality as good as that of standard microphones. This is because, usually speakers are designed to have a high bandwidth compared to microphones as they are designed for human audibility but not for human speech. Audibility range for humans range from 20Hz to 20KHz (~20KHz bandwidth) and Speech ranges from 300Hz to 3KHz (~3KHz bandwidth). So, using an earphone as microphone is same as using a microphone which accepts audio frequencies from 20Hz to 20,000Hz but major part of our speech signals lie only in the range of 300 to 3KHz. This means that our earphones accept many undesired signals along with our speech signal which may lead to disturbance or noise added to our speech. So, we have to shout louder to compensate signal distortion due to noise. How does it work and Does it Work for all Earphones? This trick works only for dynamic loudspeakers (you may call it dynamic earphones) which are designed by using a diaphragm and coil wounded as electromagnet. It works using the principle of electromagnetic induction. Dynamic loudspeakers and dynamic microphones are same(similar) in internal design. So our dynamic loudspeakers can work as dynamic microphones when its input and outputs are interchanged. Fortunately, most earphones which you find are of this kind. So, greater is the probability that this works for your earphone. I used to use it in my childhood when I did not have a microphone while using speech recognition feature in MS Office 2003. I remembered this trick a few days ago when my microphone was malfunctioning. It worked again so I am writing here. I remember my classmate and friend Mahesh Kumar Konga told me this long back in high school days. So credit goes to him. 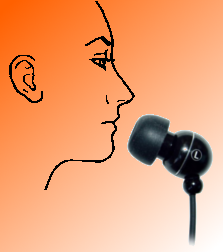 Although an earphone may not provide quality speech as good an actual microphone, but it is a quick substitution for a microphone in case of unavailability. It is not in mine(samsung) although after clicking the button on the wire. If any possible solutions then send it rock.electronics@ymail.com. Please.....Please.....Please.... if possible. This is something really new for which i was looking for.Thank you for this post and vital information.